This morning the Basque nightclub at the famous Hollywood and Vine intersection erupted in flames and our LA City Firefighters responded to the call. Within a few hours, the flames were under control. 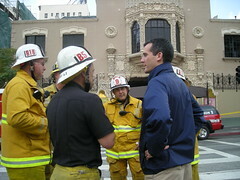 Every emergency reminds of how fortunate we are to have a skilled and professional fire department in Los Angeles. We are grateful to the men and women who bravely fought this fire. 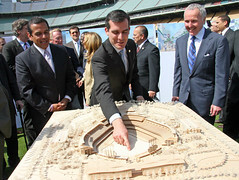 Yesterday I joined Mayor Villaraigosa, Councilmember Ed Reyes, and Dodgers owners Frank and Jamie McCourt in unveiling plans to modernize Dodger Stadium by 2012. They've hit a home run with their plans to increase green space and reduce the impact on neighborhood traffic while preserving LA's beloved stadium. I'm especially excited that the proposal includes an aggressive move toward greening the facility. The plans include almost doubling the number of trees, new water and energy efficient technologies, expanding recycling programs, and eco-friendly landscaping, including the unpaving of more that 15 acres of parking lots. As a kid growing up in Los Angeles, I came to Dodger stadium and cheered for my home team. A dream came true when I was invited to throw the first pitch at a game. Now, I can't wait for these renovations that will update this jewel for the next generation of Dodger fans. 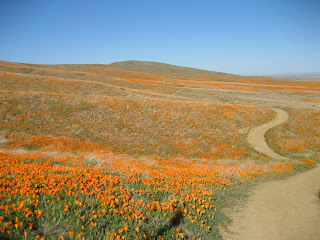 I got a jump on Earth Day yesterday by driving at 6am out to the Antelope Valley California Poppy Reserve to see the low hills of the high desert are painted with acres of the magnificent bright orange flowers that are our official state flower. Get there in the next couple of weeks--it is extraordinary (but bring warm clothes--it is still quite cold up there). There is no more incredible reminder of the work we have to do to preserve our environment than to see it flowering around you. Today, we are celebrating Earth Day in City Council by voting on the nation's largest Green Building Ordinance. This ordinance will help reduce our energy and water use, lessen the consturction waste going into our landfills, and lower carbon emissions in the City of Los Angeles. What can you do today and throughout the year? Start by taking this quiz about your personal ecological footprint. See what you can do to take one car trip off the road this week by carpooling, taking public transit, walking, or biking to your destination. And think about the impact of one meal you eat this week (check out this LA Times article on the carbon footprint of your food). Yesterday I went into the Silver Lake Reservoir with 89.3 KPCC-FM's John Rabe. We taped a segment for his show Off-Ramp. Catch it this Saturday at noon. In the meantime, here's a little video from the bottom of the reservoir. Thank you for 30 years, Chris! Today we honored Paramount Pictures Senior Vice President Christine Essel's 30 years of work with the studio and service to the community. Throughout her three decades of work at Paramount Pictures, she has played an important role in defining the company’s role in the community as a philanthropist, employer, and neighbor. Chris joined Paramount Pictures in 1978, serving in a number of capacities that include heading the Planning and Development Division during which time she led efforts to renovate, expand, and beautify Paramount’s historic studios in Hollywood. She currently serves as the Senior Vice President for Government and Community Affairs, supporting numerous community organizations through the company’s corporate giving programs, community outreach efforts, and employee volunteer programs. Chris has also served in leadership roles at a number of civic organizations. She is currently serving her second year as chair of the Central City Association comprised of more than 450 member businesses, non-profit organizations, and trade associations. She is an active Board Member of the California Film Commission, where she has been a member since 1985 and served nine of those years as chair. She is also the Vice Chair of California Workforce Investment Board, and served for seven years as a Community Redevelopment Agency Commissioner. Council President Pro Tem Wendy Greuel and I commemorated the 93rd anniversary of the Armenian Genocide with a special presentation in City Council. 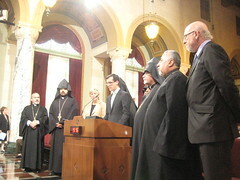 We were pleased to be joined by Armenian community dignitaries and leaders, including Archbishop Hovnan Derderian, Western Diocese of the Armenian Church of North America; Archbishop Moushegh Mardirossian, Prelate of the Western Prelacy of the Armenian Apostolic Church; and Andrew Kzirian, Executive Director, Armenian National Committee of America Western Region. Each year, Armenians and people of Armenian ancestry all over the world commemorate this darkest event in their history of more than 3,000 years. On this 93rd anniversary, let us all recommit to learning from the mistakes of the past so that we do everything we can to ensure a crime of this magnitude never happens again. I'm very proud that our At the Park After Dark program has been named a finalist for the Neighborhoods USA Best Neighborhood Program award. Established in 1975, Neighborhoods USA is a national non-profit organization committed to building and strengthening neighborhood organizations. 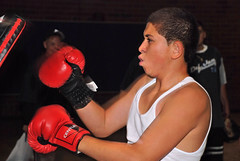 Last summer, I started At the Park After Dark at the Glassell Park Recreation Center to keep it open until 11 p.m. and offer activities that we hoped would be of high interest to at-risk kids in the neighborhood. After a 16 year-old girl was shot and killed just two blocks from the Rec Center just a few months before school was going to let out for the summer, I knew we had to provide a safe, supervised place for young people during those long, hot months. 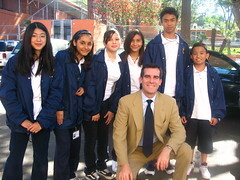 Our goal was to provide a great place for all of the neighborhood's diverse youth. 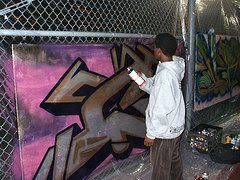 We wanted to attract kids that might otherwise turn to gangs, and we succeeded in bringing a wide range of young people to the park for activities such as boxing, graffiti art, skateboarding, music, basketball, swimming, and soccer. 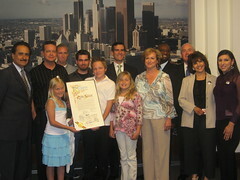 I want to extend many thanks to all of the people and organizations that made the program successful last summer, including the Department of Recreation and Parks, Department of General Services, Aztecs Rising, ArtStorm, the Los Angeles Police Department, the Glassell Park Improvement Association, and all of the parents and young people who participated in At the Park After Dark. Last night in his State of the City address, Mayor Villaraigosa said he plans to add similar programs to other recreation centers across the city. I am looking forward to working with him to give more young people the opportunity to have a great place to go during the evening this summer. Today I joined Councilmember Tom LaBonge and LAUSD Board Member Yolie Flores Aguilar to announce that we have received a $900,000 grant from CalTrans to make improvements around King Middle School that will make it safer for students to walk or bike to school. When I was growing up, most kids walked or biked to school. Today, only 15 percent of California students who live near their schools walk or bike. This grant will help us make walking or biking to school a safer experience at King. I want to extend a special thanks to the students in the leadership class and on the drill team for helping with this morning's announcement. Wednesday marks the 80th year the current City Hall building has served Los Angeles, and in the spirit of the occasion, I’d like to share a few of the lesser known facts about the nucleus of our local government. Although the building may not seem like a Goliath today, when it was built in 1928 it was the only building allowed to exceed 150 feet, towering over downtown at 28 stories. The builders of City Hall (one of whom was Councilmember Jose Huizar’s grandfather) solidified its cornerstone with sand from every California county and water from every mission. 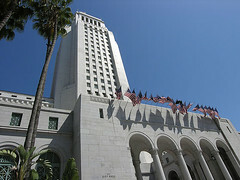 Since then, City Hall has not only served as the seat of government, but has played an essential part in several films and television programs, perhaps its most famous being the office of the Daily Planet in the Superman television series. Next time you come by, take a closer look! Celebrating LA’s leading role in the fashion world, today in Council I recognized Rami Kashou, runner-up on this season of the hit TV show Project Runway and Council District 13 resident. Known for his refined draping and dramatic gowns, Rami embodies the innovation and creativity that makes Los Angeles such a dynamic city. He did a great job of representing our city on Project Runway, and he will continue to ensure that Los Angeles remains on the map as a cutting-edge leader in the fashion industry. 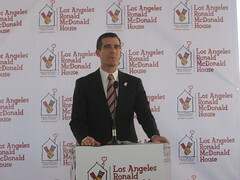 I attended the opening of a new Ronald McDonald House facility in CD13 at Lyman Place. This new facility will more than double the Ronald McDonald House’s capacity to serve families of children hospitalized for cancer and other illnesses, providing low cost, often free, lodging to 75-families per night. The Ronald McDonald House at Lyman Place features hotel-style bedrooms with flat-screen televisions in every room, a fully-stocked kitchen, a state-of-the-art theatre and fitness center, a recreation area, computer room, and laundry facilities. Additionally, Ronald McDonald Houses provide families with the added comfort of being surrounded by those who understand and can relate to the ordeal of having an ill child. Click here to learn more about the Ronald McDonald House organization. Help choose the Best of LA! 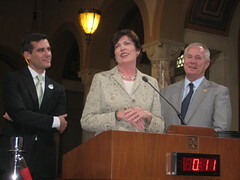 The day after college basketball crowned its national champion and wrapped up its own best-of-64 tournament, I was joined by Councilmembers Jan Perry and Tom LaBonge and the editors of Los Angeles Magazine to unveil the Sweet Sixteen in its Best of Los Angeles tournament. What began as a wide variety of LA’s best – including CD13 gems Amoeba Records and Grauman’s Chinese Theater – has been whittled down to 16 finalists. 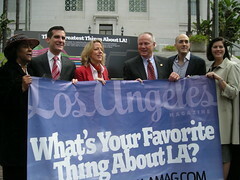 You can see a complete list of the remaining contenders and vote for LA’s best at LA Magazine’s website. The deadline is Monday, April 21, so check it out and help us determine which LA hotspot deserves to be called the Best of LA! You may have seen the New to the LA Blue ads around the city – at bus stops and in newspapers. 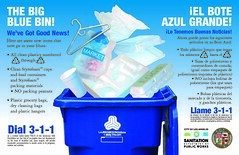 The Bureau of Sanitation wants you to know that the Blue Bins now accept a cadre of new recyclables – from plastic bags and hangers to Styrofoam cups and containers. We're already the best big city recycler in the nation, diverting 62% of our waste from landfills, by adding these items to a recycling stream we are moving even closer to our goal of a zero waste city. Just as important as putting more into the blue bin is putting the right materials in – it's important that plastics, cans, and bottles are all clean before they get thrown into the blue bin. For more information on what you can and can’t put in the blue bin, visit the Bureau of Sanitation's website.